I was in Florida the day Sherry Arnold left her quiet home in Sidney, Montana for her normal early morning run. It wasn’t until several days later when I returned home and was getting caught up on blog posts when I read from her cousin Beth at Shut Up and Run that Sherry never came home. I didn’t know much about Sherry, but my heart fell into the pit of my stomach when my mind immediately thought, “She’s not coming home.” I knew even less about Sidney, but I was pretty sure nothing like this ever happened there. Still, I continued reading all the updates I could find and praying and hoping that maybe everything would turn out okay. Maybe she was struck by a car and it was just a matter of time before someone at the hospital could identify her and call her family. Maybe she was hurt and moved away from the road and someone would find her nearby if they kept looking. Maybe Sidney was just a whole lot bigger than I thought and she had to be somewhere. Sherry Arnold has been presumed dead. Two men charged with aggravated kidnapping are being held. All the authorities have found was one of Sherry’s running shoes near the spot where she disappeared. I know first-hand what it feels like to have someone close to you ripped out of your life without warning. I can’t imagine what it feels like to have that person ripped violently away. My heart aches for her children, her husband, her family, her friends, her students, her neighbors and her community. I think of Sherry often, in fact. My mind wonders and I pray that she somehow found peace in her final moments here on this Earth. Was she scared? I know I would have been. Did she fight? For her life. What was she thinking? I wouldn’t even know where to begin. Was she strong? Without a doubt. Why? There has to be a reason, right? Did she know someone would look for her? Absolutely she did. This type of thing always happened to someone else’s mother, wife, sister, cousin, friend, teacher or neighbor. And it certainly didn’t happen to a fellow runner. My heart was filled with sadness for the person that was lost. How could this happen? Still, the news of Sherry’s death really hit home when I started thinking of my own safety and the safety of those around me. We take so much for granted everyday. We become one with our routine and we throw caution to the wind. It will never happen to me. It will never happen to my friend. That kind of thing doesn’t happen around here anyways. I was standing in the kitchen talking to my husband about what happened to Sherry and I said, “At least you always know where I run.” He stopped what he was doing and said, “No, I really don’t.” I stopped what I was doing. He wouldn’t know where to look for me. So many times I run out the door without even saying what direction I’ll be heading. I just assume he knows. Not anymore. Within the last few weeks, there have been multiple reports of a suspicious person on the trail where I run at least once or twice a week. He is making people feel uncomfortable; getting too close to them, mumbling unclear things, walking just off the regular path. The police are aware, but nothing as happened. Yet. I hope nothing ever does. Yet, I think about the people that use that trail every single day. I think about the people who haven’t heard the warning, who aren’t paying attention, who don’t think they have anything to worry about because they run there all the time. Run alone? Not anymore. Not for awhile. What happened to Sherry could have happened to any one of us. I have also experienced first hand the love and support that the running community harbors. We are an amazing group of individuals. We’re not selfish and we don’t shy away from tragedy. We dive in, head-first and help those who are left pick up the pieces and try to carry on. We remember. And we want the world to remember too. Beth has organized a virtual run for Sherry this Saturday, February 11 and all she asks is that you run, walk, skip, hop, skate, bike, roll, or glide a little ways to remember the beautiful person that Sherry was. Sherry was a runner. And what better way to remember her than to go for a run. Wouldn’t she do the same for any of us? Click to print your own bib! I will be running seven miles this Saturday, and I will be thinking of Sherry as I run. Not just of the horror that was her death, but of what I know about the goodness she brought to those who knew her. I will be thinking of her children, her husband, her family, her friends, her students, her neighbors and her community. I will be praying t hat they might find some small comfort in the fact that she was so loved. Even by those who have only known her through words. Like me. The next seven are for you, Sherry. May you rest in peace. My hubs and I had a similar conversation about my runs. He has even felt the need to follow me in the car a couple of times, God love him! I will be running 8 miles on Saturday and think it is amazing how many other runners will be doing the same thing in her memory. Great post Sara. 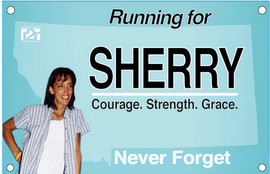 I intend to run for Sherry on Saturday as well. Great post Sara! I totally have had her on my mind ever since I heard about it. Terrible story. Hope the creepy trail guy goes away! UGH!